Among lush greenery, residents will find Mountain Ranch Apartments, a thoughtfully-designed apartment community in Fayetteville, Arkansas. Our community embodies all of the comforts of luxury apartment living with a value-driven price and energy-efficient features, which offer exceptional savings for university students and staff alike! Mountain Ranch Apartments individual homes boast a well-designed space with the convenience of modern black kitchen appliances, a full size washer and dryer, an expansive garden bath tub, and French doors that lead to a private patio or balcony. An all-inclusive community for an active lifestyle, Mountain Ranch Apartments offers a resort-style swimming pool with a poolside cabana, and outdoor resident lounge, a media room with game console and movie theatre, and a 24-hour fitness center. Setting new standards for affordable, luxury apartment living, we will surpass all of your expectations at Mountain Ranch Apartments. Call for your personalized tour! 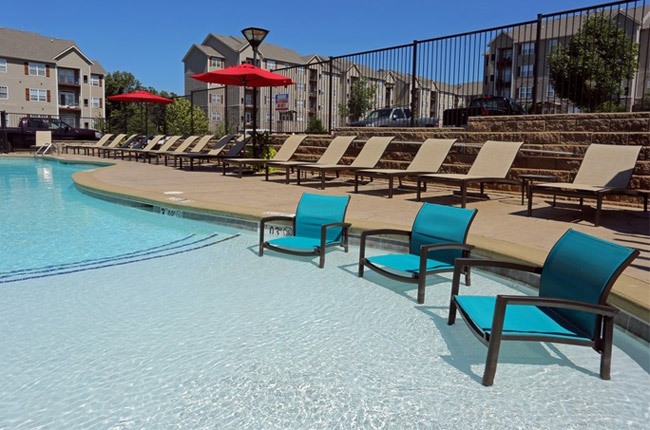 Located right off of Interstate 49, Mountain Ranch Apartments boasts a central location in the heart of Fayetteville, Arkansas. We are under ten minutes from The University of Arkansas campus, making our apartment community the ideal place for university students, staff, and personnel to settle down. Whether you’re a student or not, residents will enjoy the number of restaurants that populate the area: sink your teeth into a juicy burger at Hugo’s, sample some of the best curry at Original A Taste of Thai, or indulge in an innovative grill cheese at Hammontree’s Grilled Cheese. If you prefer to cook a meal at home, there are two Walmart Supercenters, one located to the north of our community and the other to the south. Golfers will marvel at the selection of golf courses in the area including Fayetteville Country Club, Stonebridge Meadows Golf Club, and Links at Fayetteville Park. As far as convenience is concerned, we have you covered with our central location at Mountain Ranch Apartments.